Police violence, like the killing of Michael Brown in Ferguson, Mo., also happens routinely in France, but the political and media treatment that these incidents receive isn’t the same. The French press is willing to see the injustice in Ferguson but rarely acknowledges that injustice in its own country. 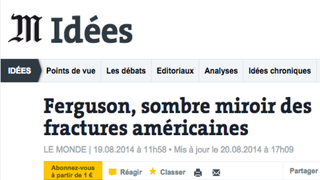 Le Monde decried “the persistence of the American racial divide” represented by Ferguson. Le Figaro points out the political consequences of racial profiling. And Paris Match covered Missouri state Police Capt. Ron Johnson, who is black, for his role in trying to bridge the divide between police and Ferguson’s black citizens. But there’s no such coverage of “the persistence of the racial divide” in France. Two days before Brown was killed, a 42-year-old man was found dead in a police precinct in Le Havre. On Aug. 21, 51-year-old Abdelhak Goradia died in “unexplained circumstances” while in police custody in Roissy. Five days later, 23-year-old detainee Houcine Bouras was shot while handcuffed inside a police van. But in France, it’s the same recurring scenario: A police intervention goes bad; a man is killed—frequently young and of color; the police plead self-defense or unexplained causes; the media reports only the “official” version of events; the neighborhood revolts; the revolt is crushed; the victim’s family brings a civil suit; and the officers involved are rarely held accountable. Brown’s case calls to mind the 2005 case of Bouna Traoré, the teenager who was electrocuted in Clichy-sous-Bois after running from police who were searching for suspects after an alleged break-in. His death left an entire community in mourning. From one side of the ocean to the other, even if the circumstances of these dramas are not identical, their causes and consequences are the same. Even though Traoré wasn’t killed by six bullets at close range, his death can be tied to police pressure directed at the residents of working-class neighborhoods. Unfortunately, hundreds like him, before him and after him, have been riddled with the same state bullets. When we talk, though, about covering up police misconduct in the U.S., the racial prism seems obvious for France’s national commentators: A white police officer kills a black citizen and that falls within the context of American structural and historic racism. But even though France has its own long history of slavery and colonialism, our media, usually fond of highlighting this type of detail, omits mentioning it when discussing homegrown police violence. On the contrary, in France, when an Arab or black citizen dies at the hands of white policemen, seldom is the skin color of the victim or the alleged killer mentioned. And while the French notion of “universality” is a big deal when it comes to seeing “colorless” French citizens, as opposed to the American “multiculturalism” that we love to put down, France is actually colorblind only when to it is to our advantage. That the French firmly condemn the events in Ferguson is a good thing, of course. But let no one be fooled: In the mirror that Ferguson holds in front of us, France should recognize its own troubled image. France should feel the pain of its own citizens who, because of their identity, are racially profiled and brutalized. French President François Hollande promised to improve relations between citizens and police by adopting a fair and objective procedure during police ID stops. He once seemed to grasp that police stops, as practiced, were the reason for much of the abuse of black and Arab citizens, as well as for the resulting “riots” that these incidents have generated. But Hollande has regressed toward support for the pro-police policies favored by Prime Minister Manuel Valls. The back-to-school season arrives amid raw tension in the U.S. as protests in Ferguson continue to demand justice for Brown, with a backdrop of debate about police and in the absence of the political will to stem police violence. And, as in Ferguson, tensions will remain in France. Sihame Assbague is a spokeswoman for the national campaign against racial profiling. Follow her on Twitter. Rokhaya Diallo is a French author and filmmaker. Follow her on Twitter.